Foolkiller introduces us to its titular character, also knows as Greg Salinger, through his man purse. Which he’ll thank you to know he can easily pull off. When we last left him in Deadpool, he was a merc for money with ambitions to become a therapist. Turns out SHIELD has somehow overlooked his past – or used it to their advantage – and made him into a psychotherapist whose job is to reform supervillains. The name Foolkiller is still apt, however, as the ones who are to fool to reform must be terminated. 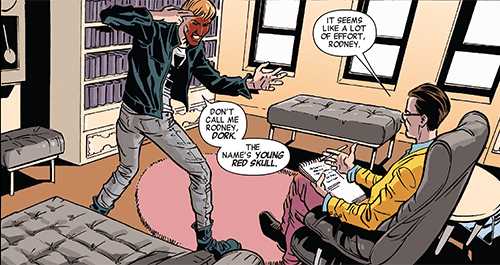 Plot: Greg is in the middle of a session with a man named Rodney, who prefers to go by Young Red Skull due to the dried blood caked on his face. He convinces the would-be Hydra worshiper not to model himself after that idea by bringing up stories from his own past. 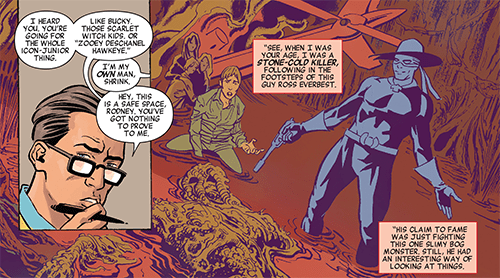 Story: Because of the way that Max Bemis lays out Greg Salinger’s backstory, Foolkiller is an easy book to follow even without ever having read a Deadpool or Mercs for Money book. Greg is forthcoming about himself now that he thinks he’s on the right track, and his attempts to get through to his first patient are at turns heartwarming and hilarious. While the first few pages give the impression that therapy is something Greg was born to do, flat out calling Rodney a racist and confusing his own past for his patient’s reminds the read that he has spent much more time being a Foolkiller than a therapist. This issue pack a punch in the form of the whiplash ending, which opens up plenty of doors for future issues. The build up to Greg’s heel-face-turn didn’t feel as earned as it might have, but that is mostly because the story also had to set up the mystery surrounding S.H.I.E.L.D. as well as the normal life Greg was currently leading. 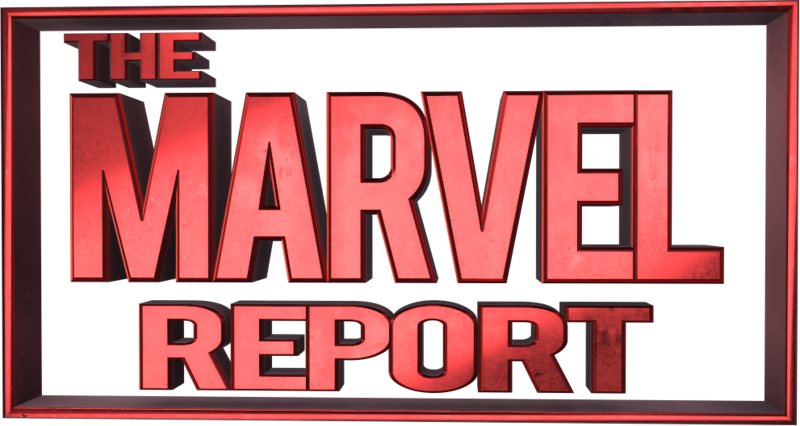 Whether you saw the twist coming from the start or not, the final splash page sends chills down the spine. 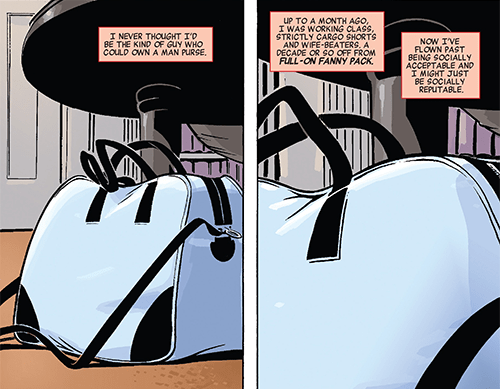 Overall, Foolkiller #1 was a great introduction to a multifaceted character… and to his man purse. 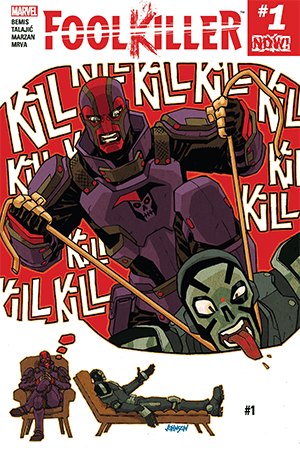 Art: Foolkiller is full of bright art that pops off the page, thanks to the combined work of Dalibor Talajic, José Marzan Jr. and Miroslav Mrva. The clean and crisp lines and colors of Greg’s new office contrast wonderfully with the more vibrant but messier flashbacks to his days as an assassin. It feels like there are two separate identities within Greg fighting for dominance, and in that way the art tells a story that the writing merely implies. Even the lines get blurrier in the flashbacks, which helps to visualize the different aspects of Greg’s personality that come to the forefront at any given time. The letteringby Travis Lanham also goes a long way to showcasing the protagonist’s psyche. Red overtones recall his blood-spattered history and remind us how close to the surface that thirst is bubbling. The writing is excellent so far, but it is the art that pushes Foolkiller to another level. Verdict: If a mix of pathos and humor is what you crave alongside your ruthless antiheroes, or if you’ve already been introduced to Greg Salinger via Deadpool, then this #1 is absolutely worth it. Just be prepared for plenty of moral ambiguity along the way!